Who knows that the Wall Street, in the face of fierce attack from all over the world, may crumble much faster than the Wall itself? Traditions have it that the Dutch had built a protective earthen wall to defend New Amsterdam from attacks from the North. New Amsterdam, along with New Netherlands, was eventually occupied and renamed as New York City and New York State respectively. The street was built at the site of, and named after, the Wall. The Wall then caved in to the British attacks from the North. The Street will fare no better if the attacks are persistent, focused and fierce. This last citadel, and symbol, of capitalism may be occupied by economically oppressed classes. But what will come next? Occupy Wall Street (OWS) is an ongoing series of demonstrations in New York City based in Zuccotti Park in the Wall Street financial district. Initiated by the Canadian activist group Adbusters, the protests were inspired by the Arab Spring movement, especially Cairo’s Tahrir Square protests, and the Spanish Indignants. They are mainly protesting social and economic inequality, corporate greed, and the power and influence of corporations, particularly from the financial service sector, and of lobbyists, over government. 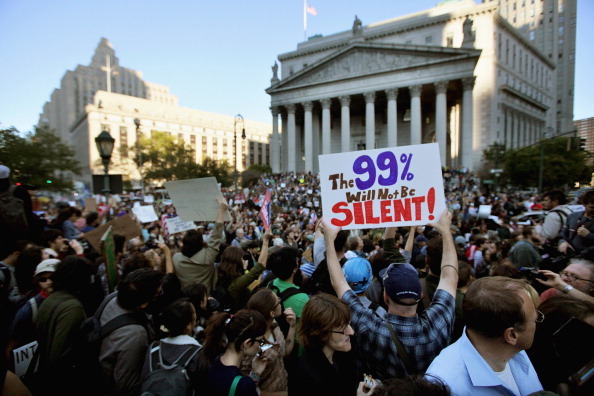 The participants’ slogan “We are the 99%” refers to the difference in wealth between the top 1% and the other citizens of the United States. The OWS movement is being projected as if the war drums for another Communist Revolution are about to be beaten. It is like: the Commies are coming again. According to NewScientist, OWS is a unique effort to untangle control in the global economy. The idea that a few bankers control a large chunk of the global economy might not seem like news to New York’s Occupy Wall Street movement and protesters elsewhere. But a study, by a trio of complex systems theorists at the Swiss Federal Institute of Technology in Zurich, empirically identifies such a network of power. It combines the mathematics long used to model natural systems with comprehensive corporate data to map ownership among the world’s transnational corporations (TNCs). The movement has given hope to millions around the world. A similar hope was given by Modern Socialism which originated from an 18th-century intellectual and working class political movement that criticized the effects of industrialization and private property on society. Utopian socialists such as Robert Owen (1771–1858), tried to found self-sustaining communes by secession from a capitalist society. Henri de Saint Simon (1760–1825 coined the term socialisme and advocated technocracy and industrial planning. Saint-Simon, Friedrich Engels and Karl Marx advocated the creation of a society that allows for the widespread application of modern technology to rationalize economic activity by eliminating the anarchy of capitalist production that results in instability and cyclical crises of overproduction. But is this movement and its outcome a mere middle-class fantasy? According to a report by Reuters, for all the sympathy it inspires, the movement may struggle to build mass participation. Edgar Aracena, a New Jersey-based organizer for the Health Professionals and Allied Employees union, has been an activist since he was a student in the early 1980s. He said many Americans have an ideological problem with economic-based protests. There is a fantasy in the United States that we are all middle class and we will all be the boss one day. People buy into that. As the protests enter their fourth week, the size of the crowd has begun to grow. As many as 5,000 protestors marched on Wednesday. Such numbers pale besides the 50,000 or 60,000 protesters who would gather at International Monetary Fund and World Bank meetings a decade ago or the more than 250,000 people who marched against the Iraq war in New York City in 2003. Still, the protest is among the largest in New York since demonstrations against the Bush administration at the 2004 Republican Convention, which organizers said drew 500,000. But as the nascent movement gathers steam, struggles and problems are apparent. Is their message clear enough? Who is their leader? How long can they last, camped out in a concrete park as the weather chills? Who will control it? Such questions have sown discord. Communism and Socialism were dreams of the working class in the last century but the movement crumbled and the largest communist empire disintegrated not because of any other factor but because of the dissatisfaction of people this movement sought to liberate from capitalism. The failure of the movement did not prove the flaws in the ideology, it only proved that the system can work only if it is incorruptible and serves the common man. The system practiced in the USSR proved to be a capitalism of the bourgeois classes doing with the common man what the Wall Street is doing today. If the movement leads to restructuring of capitalism by its pundits, it will be a huge dividend. But if it proves to be another socialist movement, the oppressed classes will remain oppressed forever. However, the dissatisfaction screams at the top of its voice. It seeks to be heard. It seeks to bring an end to exploitation by the system. If these voices are not heard, the world will move into anarchy and the anarchy may throw up another system like socialism. It is time that capitalism did some introspection to save itself from the looming anarchy. It is just not cricket….